Supercharge your website with the fastest CDN in Australia and enjoy our unbeatable pricing and powerful features. Make your website hop with datacenters in Sydney, Melbourne, Auckland, Perth and Brisbane and a total of 35 worldwide. BunnyCDN offers unbeatable pricing at only $0.03/GB for Asia & Oceania region with 100% Pay As You Go billing. Bring your content delivery to the next level. HTTP/2, Free SSL, Brotli, token authentication and much more come as standard. Our network in Australia means your users are always just a hop away. Traditionally, your users connect directly to your server, no matter where in the world they come from. This causes added latency when loading your content, extra hops and makes your website load slowly. BunnyCDN speeds up your website by bringing your content closer to your users. We minimize latency, maximize performance and make sure your website is loading as fast as a bunny. Join thousands of satisfied customers already enjoying our lightning fast performance. Everything you need for a simple, secure and efficient content delivery. With 35 global datacenters, BunnyCDN guarantees lightning fast performance around the globe. BunnyCDN offers powerful features such as edge rules, HTTP/2, Brotli, free SSL, hotlinking protection and much more. With one-click SSL, redundant network and powerful security features we make sure your content stays online and protected. Intuitive configuration, with all the features just a click away. BunnyCDN offers easy management of all your websites, with all the features available just a click away with a secure 2-Factor authentication system. 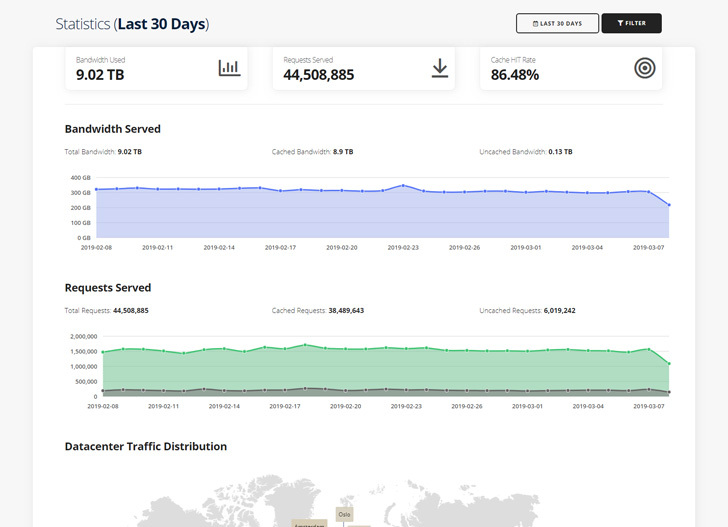 BunnyCDN provides detailed statistics about your monthly usage, with error counts, requests served, geographical distribution, raw logs and much more. Without a single point of failure, BunnyCDN provides enterprise level reliability, making sure you always stay online. Is our Australia pricing too expensive for you? You can disable any region and reroute with a click of a button in the control panel. Instantly purge one or multiple files and even the whole zone in a matter of seconds with our cache purging tool. Host your data directly on the BunnyCDN cloud storage with infinite scalability and free internal bandwidth. Get full insight into your traffic using our next generation real-time monitoring dashboard. Thanks to our redundant network and automatic monitoring, we can offer at least a 99.99% uptime guarantee. Join thousands of satisfied customers already using BunnyCDN.